I will be honest with you, I am not a big fan of the so-called ‘Bucket List’ phenomena that has crept up in the past few years. Although I do get rather vicarious thrills reading the lists of others. Yes I know, I know, I’m a hypocrite. 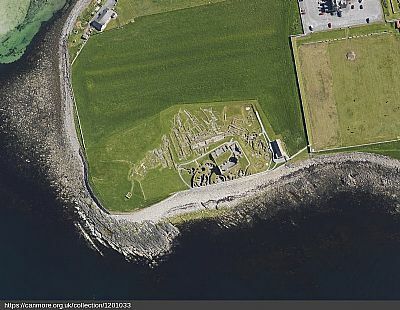 But if I did have a list, which I don’t, the archaeological site of Jarlshof would certainly be in my Top 10. 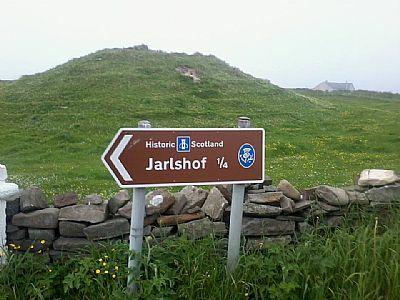 For those unfamiliar with Jarlshof it is a multi-period settlement site situated on a small remote promontory on the Scottish Island of Shetland. 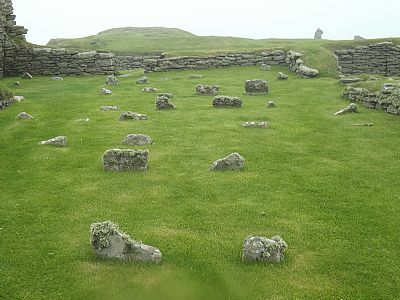 In constant use from the Neolithic onwards, archaeological discoveries so far include oval-shaped Bronze Age houses, an Iron Age broch and associated wheelhouses, Norse long houses, a medieval farmstead, and a Laird’s house dating from the 1500s. 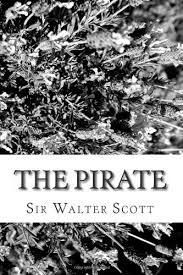 Its traditional name is Sumburgh, a derivative from old Norse, the epithet Jarlshof, meaning 'Lairds House,' was later given to the site by the Scottish novelist Sir Walter Scott when referring to a fictional house in his book 'The Pirate.' It is Scott's popular designation that has endured throughout the ongoing years. 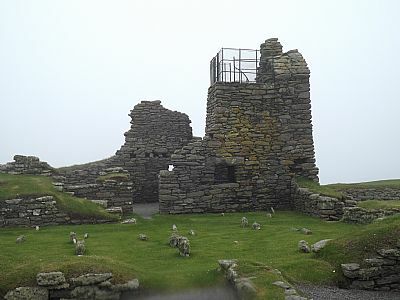 "Man, however, had in former days considered this as a remote or unlikely event; for a Norwegian chief of other times, or, as other accounts said, and as the name of Jarlshof seemed to imply an ancient Earl of the Orkneys had elected this neck of land as the place for establishing a mansion-house. It has been long entirely deserted, and the vestiges only can be discerned with difficulty; for the loose sand, borne on the temptestuous gales of those stormy regions, has overblown, and almost buried, the ruins of the buildings; but in the end of the seventeenth century, a part of the Earl's mansion was still entire and habitable. 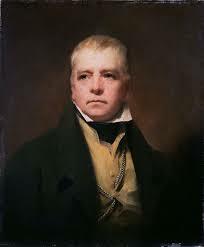 It was a rude building of rough stone, with nothing about it to gratify the eye, or to excite the imagination; a large old-fashioned narrow house, with a very steep roof, covered with flags composed of grey sandstone, would perhaps convey the best of idea of the place to a modern reader. The windows were few, very small in size, and distributed up and down the building with utter contempt of regularity. Against the main structure had rested, in former times, certain smaller compartments of the mansion-house, containing offices, or subordinate apartments, necessary for the Earl's retainers and menials. But these had become ruinous; and the rafters had been taken down for fire-wood, or for other purposes; the walls had given way in many places; and, to complete the devastation, the sand had already drifted amongst the ruins, and filled up what had been once the chambers the contained, to the depth of two or three feet. During the summer of 2014 I was very fortunate to visit the site of Jarlshof, travelling to Shetland via the more traditional route, that is boarding the overnight ferry from Aberdeen. Now when I say ‘summer,’ let us not forget that we are speaking of a Scottish summer, on an island, in the middle of the North Sea. So it will not surprise you to learn that it was an extremely cold and blustery day when I arrived at Jarlshof, whereby I and other like-minded souls often had to dive into the various prehistoric remains to take shelter from the elements. Even with such difficulties I did manage to take hundreds of photographs, clicking feverishly during breaks in the sleet showers, with the thought of ‘I’ll examine these images at a later date.’ So here we are, three years on, and somewhat later then I had envisioned, I found myself collating said images and came across something unusual. Now as I said at the beginning of this piece, Jarlshof is a world renowned settlement site, however in a couple of my images I clearly recognised what appeared to be gravestones, sticking out of the turf. How could this be? The sad truth is I don’t have a definite answer for you. Sorry about that. 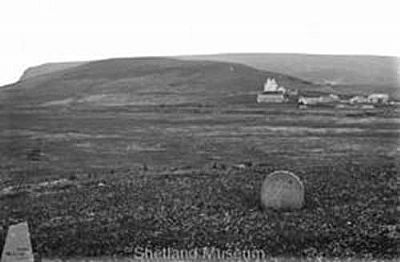 Having contacted a couple of colleagues in Shetland, to find out if they had any information for me, the latest thinking is that said gravestones probably date to the 18th century and are assumed to be those of shipwrecked sailors, Jarlshof becoming a temporary burial ground when the nearby Quendale Church became overwhelmed during a rather vicious sandstorm. Nothing remains of the church today, the site is currently marked by a large shapeless sand dune approximately three metres in height. P.S. If anyone has any further information with regards to these particular gravestones, please do get in touch. I would be most interested to discover more.